Fall is officially here. The temperature is dropping, the days are getting shorter, and the air is becoming a bit more dry. With this transition, you may need to switch up your routine, if not to protect your skin, then to at least stay up to date with the current beauty trends! Read on for tips on how to keep your skin stylish and supple all season long. As the air becomes more dry, so does your skin. It is crucial that you moisturize daily, even if you are oily. You may want to even switch from a lotion to a cream in order to maximize effectiveness and combat dryness. The best time to apply a moisturizer is right after you shower or wash your face. And it’s not just your face that could be drying out! During fall and winter, most people tend to experience cracked or dry hands. Try a hand cream like Avene Cold Cream Hand Cream or gloMinerals Luxury Hand Cream to deeply moisturize your mitts. Out with the pastels and pinks, in with the deep reds and plums. When it comes to your nails, try a deep shade like OPI Muppets Collection Pepe's Purple Passion Nail Polish or OPI Nail Polish - Got The Blues For Red. As far as lips go, think 90's: vampy, dark, and daring. For a really bold fall lip, try Pur Minerals Chateau De Vine Lipstick in Jezebel or GloMinerals GloLip Stick in Bordeaux. In addition to the deep shades for nails and lips, we're seeing a lot of flushed cheeks on the runway. Blush is making a huge comeback...as if it ever left the spotlight! Since fall and dry skin go hand in hand, try to avoid soap. This DOES NOT mean you get a free pass on washing your face. It simply means that you have to be more thoughtful about what you put on your face. Soap can be very drying. Dermalogica Special Cleansing Gel is a perfect soap-free cleanser that soothes even the most sensitive skin, while gently removing oil, buildup, and debris from your pores. Eyeliner is not just for one dainty line across your lash line anymore. This season that is made quite clear as we begin to see very creative eyeliner designs on the runway. From stripes and dots to angles and exaggerations, we are seeing a lot of inventive ways to use the traditional black eyeliner. Tap into your inner artist and see what you come up with. We recommend Blinc Eyeliner for its staying power. Or, if you are more used to a pen, try the Osmosis Colour Liquid Eye Definer. 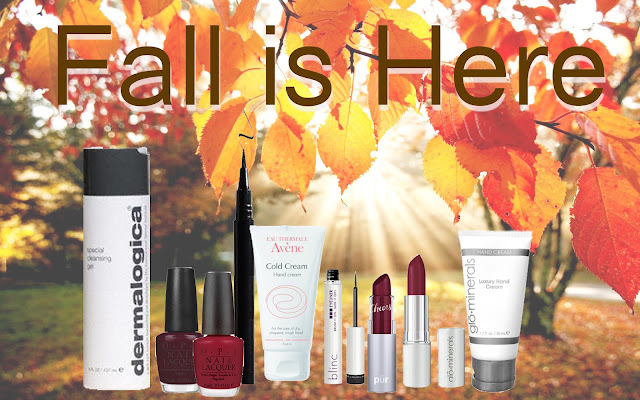 Now that you know the best ways to hydrate your skin and enhance your look for fall, you're ready to enjoy the best things about this lovely season: Halloween, pumpkin flavored everything, the magnificent leaves, Oktoberfest, and getting cozy by the fireplace with your loved ones.